Are you ready to travel to the land of Azeroth? Do you know your Harpies from your Murlocs, and your Gnolls from your Kobolds? Will you fight for the Alliance, or for the Horde? 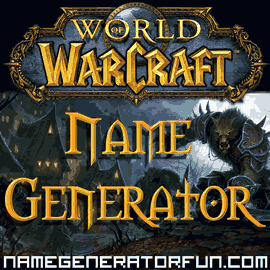 Whichever side you choose, it's time to buckle up and prepare for your new life of adventure with our World of Warcraft name generator! We cover a list of the thirteen main World of Warcraft races. You can make a random gamertag, or one that's unique to your own first and last name. It's ideal if you're just starting out in Azeroth, or if you're building a new character and you're in need of some inspiration. World of Warcraft is the biggest and longest-running MMORPG, and when you create your character there are thirteen different races you can choose from: Pandaren (panda-like creatures), Worgen (wolf-like beasts), Draenei (alien warriors), Dwarves, Gnomes, Humans, Night Elves, Goblins, Blood Elves, Orcs, Tauren (bull-like beasts), Trolls, and Forsaken (undead humans). We've created this generator so you can make different types of male or female names, with different themes for each race. Many WOW generators just create medieval-sounding names – but instead, we've done our best to add some character to each different race, while still staying within the Blizzard naming policies, however, to be sure your new name complies, check the Blizzard policy first! Because the generator has thousands of different unique name combinations, the results have lots of variety. We hope you enjoy it! Disclaimer: this is a fan commentary page intended to encourage interest in World of Warcraft. Our page is not an official publication and is not in any way affiliated with or endorsed by Blizzard Entertainment, or any of their licensees. Copyrights and trademarks for the game, books, articles, and other promotional materials are held by their respective owners and reference to them is allowed under the fair use clause of copyright law. This page is in no way intended to harm or undermine the market value of Blizzard Entertainment's works, rather to encourage fans to engage with and seek out those works. Image Credit: Pandaren from the WoW wallpaper archive.